Watching Coco, I couldn’t stop thinking about Back to the Future. Both films are about young men who travel to an impossible place and have to solve an issue with their family. Both feature the traveling character fading out of existence, they both play the guitar, both films feature important musical performances—and both hinge on a photo. That may be getting a tiny bit spoilery, but rest assured there are no more spoilers here, and besides, it’s worth it to make the comparison. 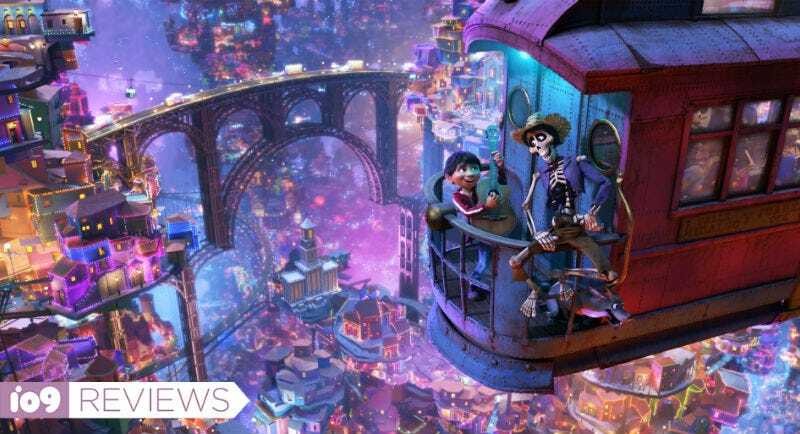 The similarities to such a revered film are just some of the many, many welcome surprises in Coco, the latest film from Pixar Animation Studios. And though some of their recent films haven’t lived up to their impossible legacy, Coco does. It’s a near-perfectly polished, goal-orientated story that plants seeds the entire way, all of which bloom over the course of the movie to elicit maximum emotion. Plus, it’s kind of like Back to the Future. Directed by Toy Story 3 helmer Lee Unkrich, Coco is set in Mexico and stars a boy named Miguel (voiced by Anthony Gonzalez) whose family hates music because of a past secret. But Miguel loves music so when he attempts to steal an iconic guitar on the Day of the Dead, he’s sent to the world of the dead. The dead live there year round, except for one night a year when they can reunite with their loved ones. But Miguel has to figure out why his family hates music so much in order to get back to the world of the living. It’s an out-there story to be sure, but we’d expect nothing less from Pixar. And like some of Pixar’s better films, Coco isn’t afraid of embracing adult themes. Obviously, the whole movie is about people who die which, itself, is a downer, but there’s also murder, betrayal, disconnection, and more. But the movie is also joyous, with plenty of humor and action to go along with its stunning visuals. This is one of those prototypical new-school animated films that adults connect to on one level, but kids can also enjoy in a more surface away. As a protagonist, Miguel is very relatable and the themes of being true to yourself despite pressures from home are universal and powerful. The more characters he encounters, the more impressive the world of the dead is. There’s Hector (voiced by Gael García Bernal) who takes Miguel through the seedier parts of the world. There’s also Ernesto de la Cruz (voiced by Benjamin Bratt), a legendary singer who represents fame and success. And all of it comes together especially well when music is involved. There are some wonderful musical scenes in Coco but they’re never overused; they only pop up to tie the story together. There are a few issues, though. The middle of Coco feels like it spins its wheels a bit on its way to the big finale. It’s humorous throughout, but is never hilarious. And while the film has some great surprises in it, the whole thing is structured in a way that you see them coming a mile away, which lessens their impact considerably. Still, those are minor gripes. The bulky middle is all relevant to the plot and characters, and the surprises are not the whole reason for the movie. And the final 10 minutes of the film have been set up with such precision through it all that even though you’ll basically know how it’s going to play out, you’ll still most likely get tears in your eyes. Coco is a wonderful movie, and one that will age incredibly because of its timeless themes and unique setting. The dead have never felt more alive.